The following statements create a data set named upsit, containing the age group and olfactory index for each subject. 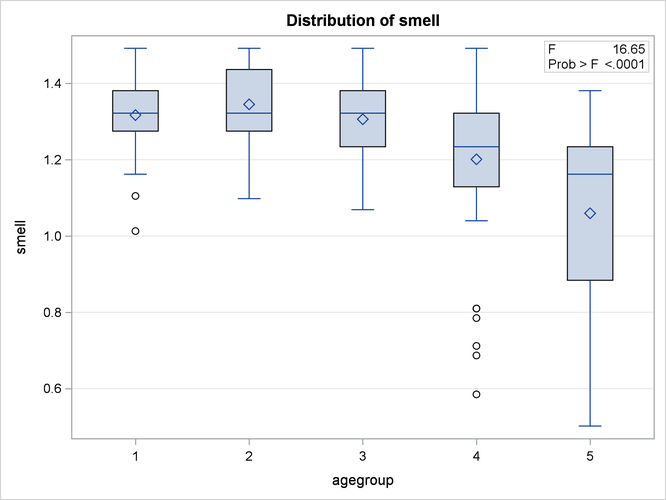 Older people are more at risk for problems with their sense of smell, and this should be reflected in significant differences in the mean of the olfactory index across the different age groups. However, many older people also have an excellent sense of smell, which implies that the older age groups should have greater variability. In order to test this hypothesis and to compute a one-way ANOVA for the olfactory index that is robust to the possibility of unequal group variances, you can use the HOVTEST and WELCH options in the MEANS statement for the GLM procedure, as shown in the following statements. Output 46.10.1, Output 46.10.2, and Output 46.10.3 display the usual ANOVA test for equal age group means, Levene’s test for equal age group variances, and Welch’s test for equal age group means, respectively. The hypotheses of age effects for mean and variance of the olfactory index are both confirmed. As discussed in Homogeneity of Variance in One-Way Models, Levene’s test or any other test for homogeneity of variance should not be used as a diagnostic for the assumption of equal group variances that underlies the usual analysis of variance. However, graphical diagnostics can be a useful informal tool for monitoring whether your data meet the assumptions of a GLM analysis. The following statements perform a one-way ANOVA as before, but with ODS Graphics enabled. In addition to the box plot that is produced by default, the PLOTS= DIAGNOSTICS option requests a panel of summary diagnostics for the fit. These additional plots are shown in Output 46.10.4 and Output 46.10.5. Output 46.10.4 clearly shows different degrees of variability for olfactory index within different age groups, with the variability generally rising with age. 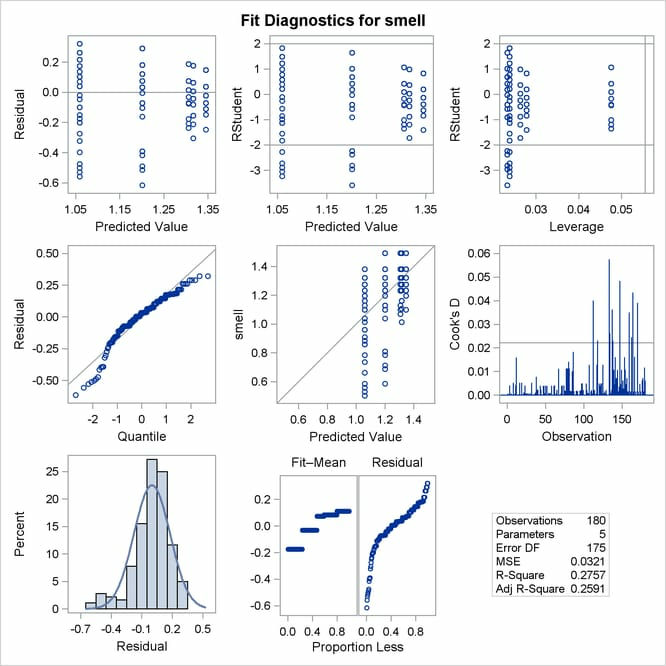 Likewise, several of the plots in the diagnostics panel shown in Output 46.10.5 indicate a relationship between olfactory variability and mean olfactory index. Also, note that the plot of Cook’s D statistic indicates that observations in the higher, more variable age groups are overly influential on the analysis of group means. The overall inference from these plots is that an assumption of equal group variances is probably untenable and that the analysis of the group means should thus take this into account.